We have been playing with the Advance and learning how everything works inside and why it repeats so well. 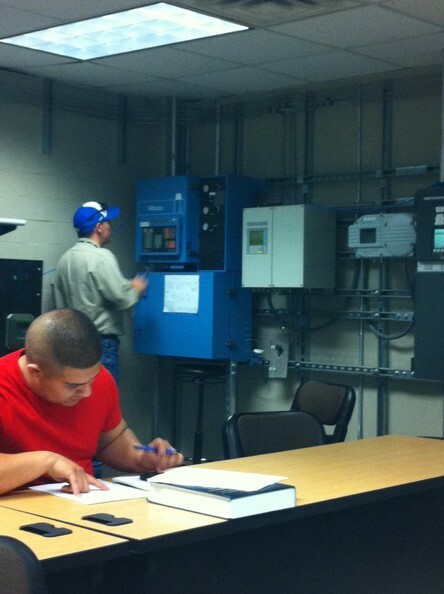 You have learned how to calculate out new response factors in order to calibrate the GC. In case we need to go over that one more time. We are going to do analyzer 2. Walk up to the computer and open the APC program and double click on Analyzer 2. With the service panel open​ hit Anlz 2 display. now we need to start the chromatogram so hit detector chrombar. Run the analyzer and make sure your gates look good. To see your results while its running hit buffer 9 display and see what your O2 concentration is and after seeing that hit display again and get your N2 concentration. After making sure your factor 101 & 102 are correct hit annalyzer display. Hit cal. The analyzer will get to the end of the cycle and do a countdown from 30 and then the analyzer will go into cal. Hit hold. The analyzer will measure the area of your peaks and calculate new response factors. It will place these in factor 201 & 202. When the analyzer reaches the end of the cycle. Hit event 10 operate. Hit run. The analyzer will go through another countdown and then start and be on stream 1 ----- process. Now we want to see our new results. Buffer 9 display and get our O2 reading and then hit display again to get your N2 reading.